Capital costs remain low, fueling steady institutional demand for office buildings, even amid record high pricing and fewer value-add opportunities. Speculative development remains steady, with numerous adaptive reuse projects like The Press in Costa Mesa. Landlords continue driving up rents wherever possible; however, tenant retention remains steady due to onsite enhancement of amenities / services and flexible workspaces. Tenants can still strike great deals with an intelligent and creative approach to leasing. And lease expirations offer the perfect opportunity for businesses to realign their workspace with their rapidly changing needs and embrace current office space trends focused on people–recruitment, retention, and productivity. Owner/occupiers are well situated to execute sale/leasebacks as a convenient and nontraditional way of raising capital or “cashing out” at a profit. And tenants may still able to buy a building, if they can find one, with very affordable SBA programs and relatively low pricing when compared to current leasing rates. Rental growth slowed marginally in the first quarter, trending with the nominal increase in vacancy, although it is too early to tell if this indicates a permanent shift. The average asking full service gross office rent was $2.79 per square foot per month in the first quarter of 2019, a nominal increase over the fourth quarter of 2018, furthering the slow and steady rental growth we’ve been enjoying. While this would indicate we’re perhaps reaching the top of the bell curve, the continuing tight supply, coupled with steady tenant demand from small businesses and co-working, and historically cheap debt, is likely to sustain further growth through 2019. It would be reasonable to expect a muted recession/office market slowdown within a couple of years, with all the political turmoil and some recently shaky economic indicators, including the recently inverted yield curve, the “hands-off” Fed, and our simmering trade war with China. However, short-term economic fundamentals remain strong in most areas, and most commercial real estate players remain bullish about the sector. The Orange County office market rally is extending into 2019. Rent growth has slowed but remains positive, and occupancy levels are elevated. Institutional investors continue to target Orange County, regularly trading trophy properties and office campuses. Landlords have reason to be optimistic, with strong tenant demand across the market and creative space in renovated and newly constructed properties providing leasing flexibility. While vacancy remains below the highs observed in Orange County in the past 4 years, it has slowly been on the rise. With little speculative construction in the pipeline, availability rates remain on a downward trend. All of this suggests that the market will remain tight, with rents continuing to rise into 2019–20 if the U.S. economy can keep out of recession. Occupancy is being driven by changing consumer preferences. Tenants have reduced their physical footprint despite having a greater number of employees. Net absorption has picked up after a sluggish start to the year, helping to mitigate supply pressures. Vacancy in the Orange County office market was 11.34% at the end of the first quarter of 2019, up 5 basis points from the prior quarter, and up 2.62% compared with the previous year. Expect vacancy to trend downward throughout 2019, based on steady job growth and consumer confidence, coupled with many tenants in the market currently shopping for space. With vacancies holding near the 10-year average of 12% so far during 2019, rent gains have grown modestly in recent months. The average asking full-service gross (FSG) lease rate per month per square foot in the Orange County office market was $2.75 at the end of the first quarter, a 3.77% increase from this time last year and a $0.02 increase from the fourth quarter of 2018. Should the national economy fall into recession, office rents will likely fall less than other major markets. are competing with traditional commercial office space for the same tenants. So far in 2019, five co-working firms have leased a combined 267,521 square feet. The unemployment rate in Orange County was 2.8% in November of 2018, down from a revised 2.9% in October 2018, and below the year-ago estimate of 3.1%. This compares with an unadjusted unemployment rate of 3.9% for California and 3.5% for the nation during the same period. The professional and business services sectors propel the economy. Orange County is also the third-most diverse high-tech sector in the nation, behind only San Jose and San Diego. Almost 200 Fortune 500 companies have space in one of the Irvine submarkets, and innovation firms including Blizzard Entertainment, Broadcom, Edwards Lifesciences, and Google have a significant footprint in Orange County. The unemployment rate in Orange County was 3.0% in February of 2019, down from a revised 3.3% in January of 2019, and below the year-ago estimate of 3.1%. This compares with an unadjusted unemployment rate of 4.4% for California and 4.1% for the nation during the same period. Between January and February of 2019, total nonfarm employment increased from 1,642,700 to 1,650,300, an increase of 7,600 jobs. Professional and business services added 3,500 jobs, with 74% of the growth in administrative and support services (up 2,600 jobs), which included temporary help firms. The construction pipeline remains slow and steady, continuing the trend of minimal development. Since the first quarter of 2018, supply additions have averaged around 240,000 square feet per quarter. Total space under construction checked in at 1,377,860 square feet at the end of the first quarter with the most notable from Lincoln Property’s Flight @ Tustin Legacy, a spec project that is expected to start delivering any day now. In Irvine, creative office conversions will compete directly with ground-up development. In Costa Mesa, work is underway on The Press, a planned conversion of the former Los Angeles Times printing plant into more than 300,000 square feet of creative office space. In Irvine, Spectrum Terrace, a 1.1 million square foot ultra-modern office campus nestled on 73 acres of open space in the heart of SoCal’s innovation hub is slated to deliver phase 1 mid-year. highest positive net absorption, with 203,512 square feet absorbed in the first quarter. Class A had a positive net absorption of 141,925 square feet, and Class C finished the first quarter with 6,392 square feet of negative net absorption. Despite slightly elevated vacancies due to new supply, rent growth continues its upward trend. Expect lease rates to continue to climb 3 – 4% annualized growth in the coming year. Demand is solid, lease rates have increased, and unemployment is down. This foundation of strong economic fundamentals has contributed to the strengthening of the Orange County economy. We expect more of the same in 2019, with anticipated vacancy rates in the 10 – 11% range over the next three quarters. Although uncertainties remain within the Orange County office market, tenants and landlords have been able to remain optimistic. Сo-working is a separate office space market segment that has developed rapidly over the past couple of years in Orange County. The growth rate of the flexible or creative office space and its impact cannot be ignored. However, in 2019, we are keeping one eye on the macroeconomic cycle with the expectation that another recession isn’t a matter of if, but a matter of when — and how severe. Also, we are basically at full employment so absorption will most likely be muted in the foreseeable future. For more information on the Orange County office space market and how to capitalize on real estate opportunities to grow your business, contact Stefan Rogers 949.263.5362 / srogers@voitco.com. 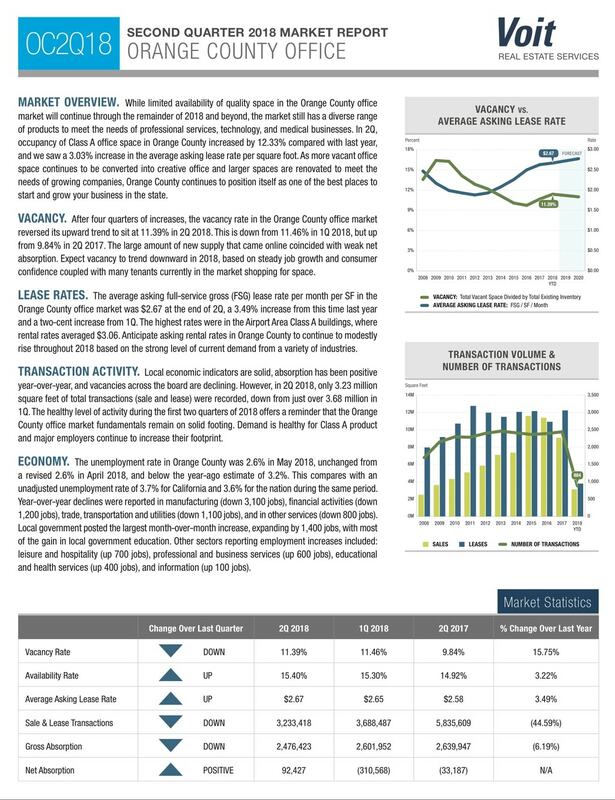 Click HERE to download Voit’s Q4 2018 Orange County Office Space Market Report. 0 Comments on "Voit’s Q1 2019 Orange County Office Space Market Report & 2019 Forecast – Just Released!"